Biblical gardens are attractions that (primarily or exclusively) cultivate plants, flowers, trees, and herbs named in scripture. As devotional and pedagogical spaces, they mobilize sensory experience to build an affectively rich relationship with the Bible. ​These gardens invite you to walk through the natural world of scripture: experience the aromas, textures, sounds, and tastes of biblical flora. If Holy Land pilgrimage promises to walk where Jesus walked, biblical gardens offer to smell the flowers and fruits that Jesus did. The modern biblical garden emerged from unexpected origins. Garden imagery features heavily in scripture, and there is a rich history of monastic gardens, but these gardens trace more directly to early botanical science. A student of Carl Linnaeus spent years collecting plant specimens throughout the Levant. Though Frederick Hasselquist died on his journey, the Queen of Sweden and Linnaeus saw to the publication of his work in 1757, the first major account of scriptural landscape and flora. ​As travel to Palestine increased after 1850, natural materials were put to new uses. A popular strategy was to send greeting cards with dried Holy Land flowers attached. The example pictured here comes from Amherst College Archives’ Emily Dickinson collection. Between 1856 and 1886, a childhood friend of the poet sent her a series of “Flower Message from the Holy Land” cards. Our first evidence of this natural history corpus used in a garden context comes from 1884. The Missouri Botanical Garden (founded 1858), which still today features a “Biblical plants” section, published this guide for visitors to locate biblical flora while walking the grounds. 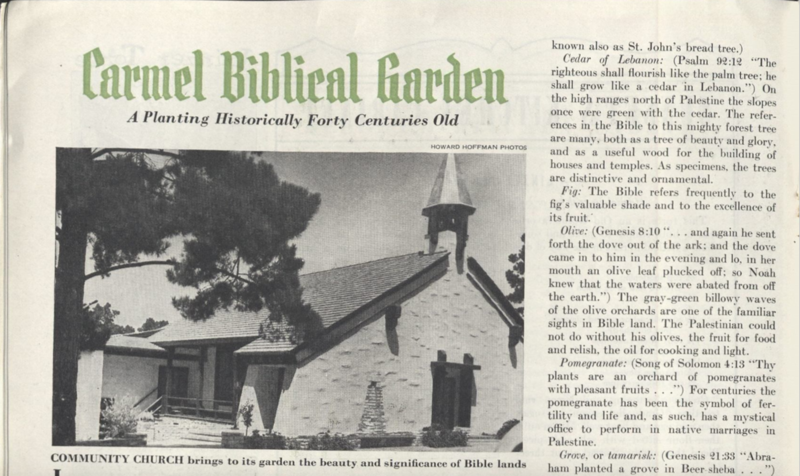 ​The modern biblical garden was fully realized by the 1940s. Eleanor King’s 1941 book was a watershed moment, the first popular book to explain which species to plant, how to cultivate them, and (as Harris did in the 1820s) emphasizing their ability to enhance biblical literacy. The first verified biblical garden comes from a Methodist church in Carmel-by-the-Sea, California. It was featured in this 1941 Sunset Magazine story. In 2017, there are at least 175 extant gardens in 25 different nations. Most are connected with local congregations, but they are also found in botanical gardens, public parks, cemeteries, grade schools, universities, and museums. The majority are Protestant (49%), but there are also Catholic, Jewish, and public biblical gardens. Most gardens around the world integrate art in different media. Here, a carved wooden Noah’s ark miniature is displayed at a Catholic garden near Split, Croatia. 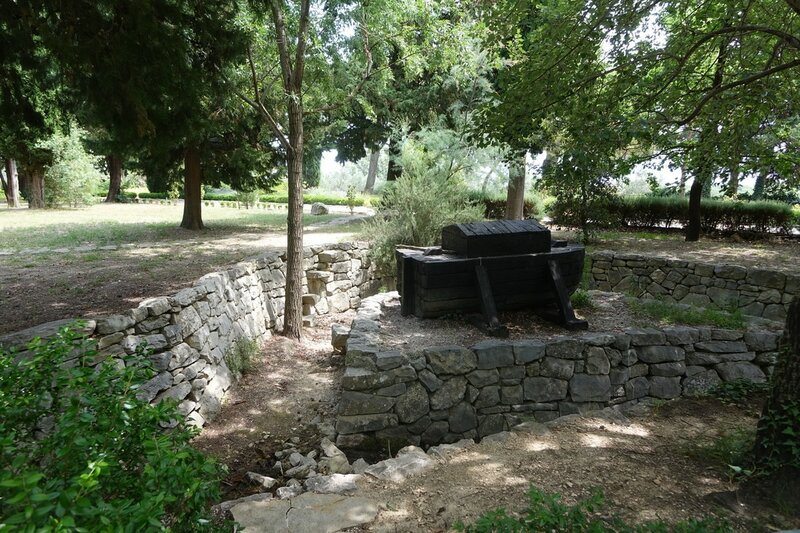 Along with art, the two most common features of biblical gardens are pathways and benches. As experiential invitations, they insist that the garden is not to be gazed on from the outside or hastily consumed. They are designed to be moved through and lingered in. 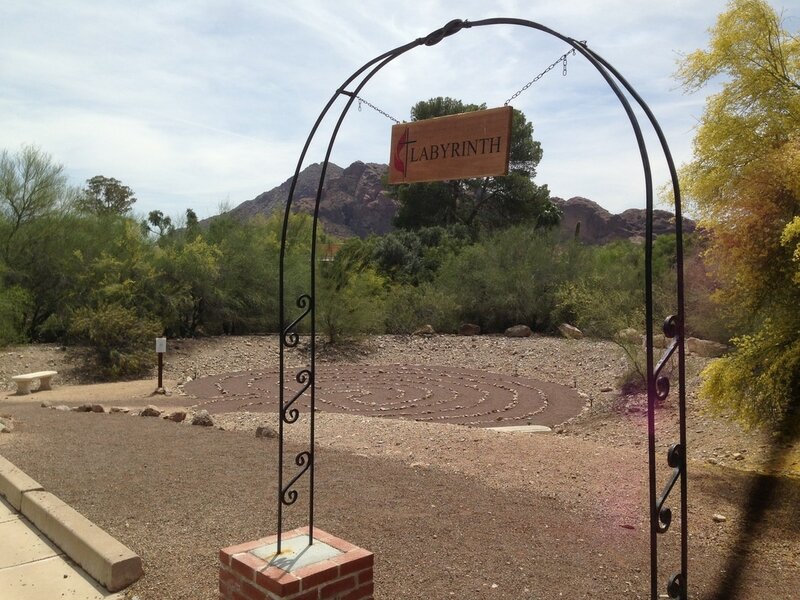 Here, a United Methodist garden in Paradise Valley, Arizona integrates the aural effect of a prayer bell. …And, a Reformed Jewish garden near Detroit, Michigan includes a replica of the Western Wall. As with the original in Jerusalem, pray-ers write their prayers on small slips of paper and insert them into the replica’s crevices. 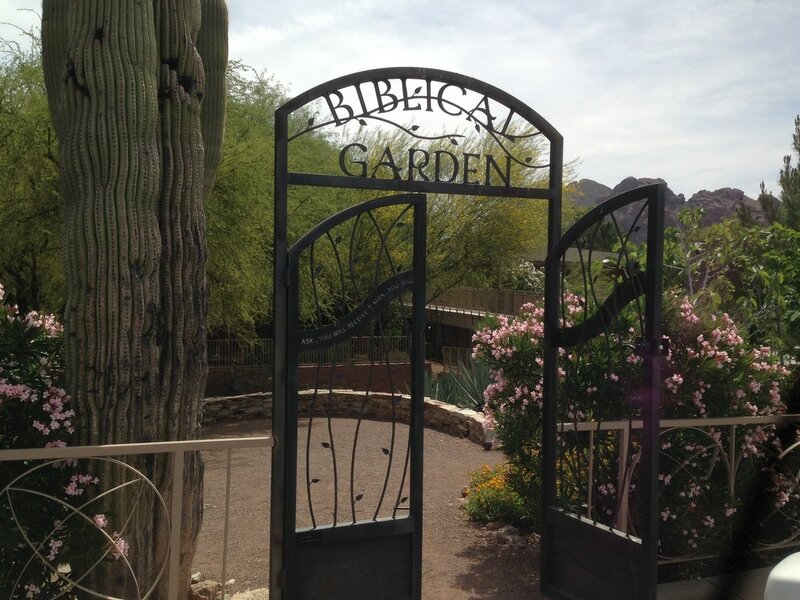 Given their multi-sensory quality, biblical gardens lend themselves to trans-medial innovations. Garden cookbooks, such as this 1976 example, expand the possibilities for using the body to build an affective bond with scripture. Embodied techniques of devotion and pedagogy via biblical flora continue with this 1996 guide to cross stitching and 2003 quilting book. 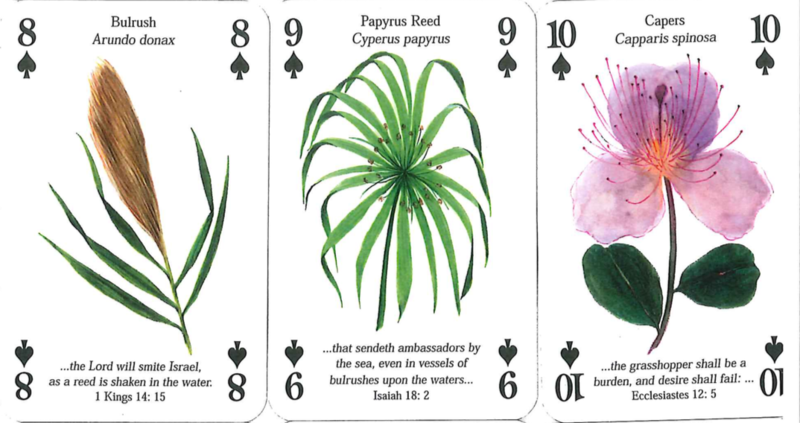 Like homespun, hand wrought crafts "plants of the Bible" playing cards keep scriptural flora close to the body, shifting the frame from art to game. To locate gardens around the world, and perhaps one near you, explore the green pins on our global map of attractions.